Moving forwards: here's to 2013! Well, here's one for recursion: it's dessert for breakfast for dessert! :) This idea has been floating around in my head for quite a while now, but I hadn't had a chance to properly realize it until a friend requested this week to have "breakfast for dessert," since she found herself too busy to ever properly have breakfast for breakfast. 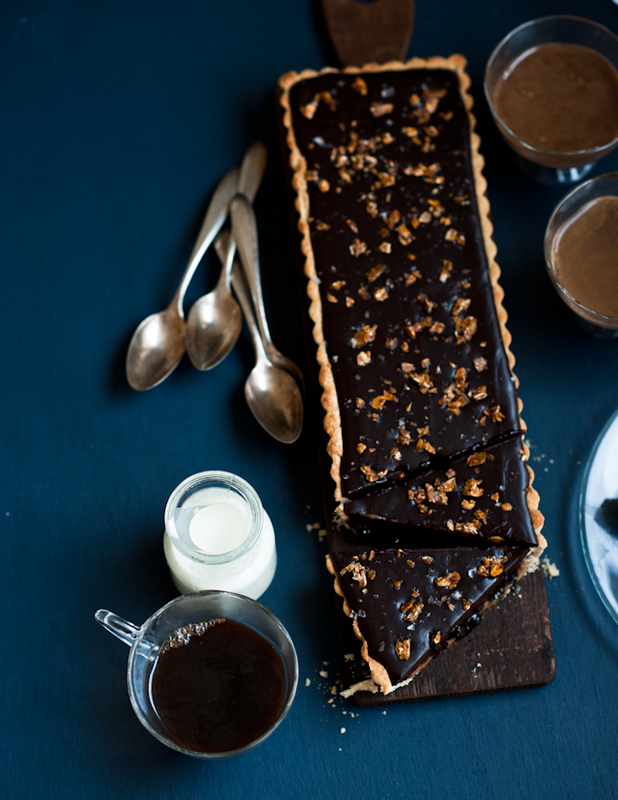 I'm never one to let friends go hungry, and so, at last, the café au lait tart was born. My inspiration behind this tart was to make it a beautiful homage to the first meal of the day, pulling together the flavors and textures that we'd normally associate with breakfast into dessert form (minus the scrambled eggs and bacon--that's so overdone). 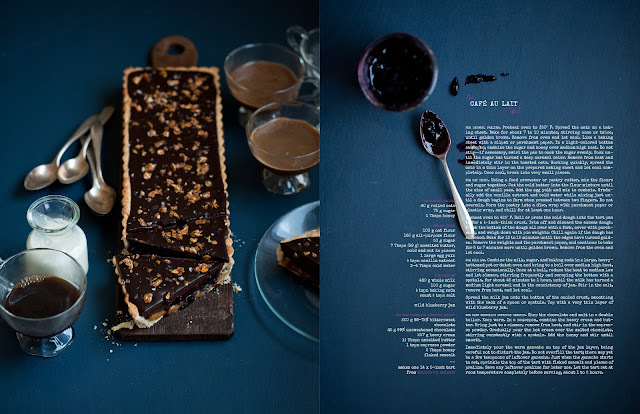 The crust has a hint of nutty sweetness from a tinge of oat flour, and then there are layers of milk jam, whole-fruit wild blueberry jam, and espresso dark chocolate ganache, all topped with golden oatmeal praline and flaked seasalt. (You can see my diagram of the dessert in the planning stages here.) The end result is at once rich and bitter and crunchy and creamy and sweet and salty--pretty much one of the most sophisticated ways to start your day, all compressed into a single bite. ...Now, if all days started this way! 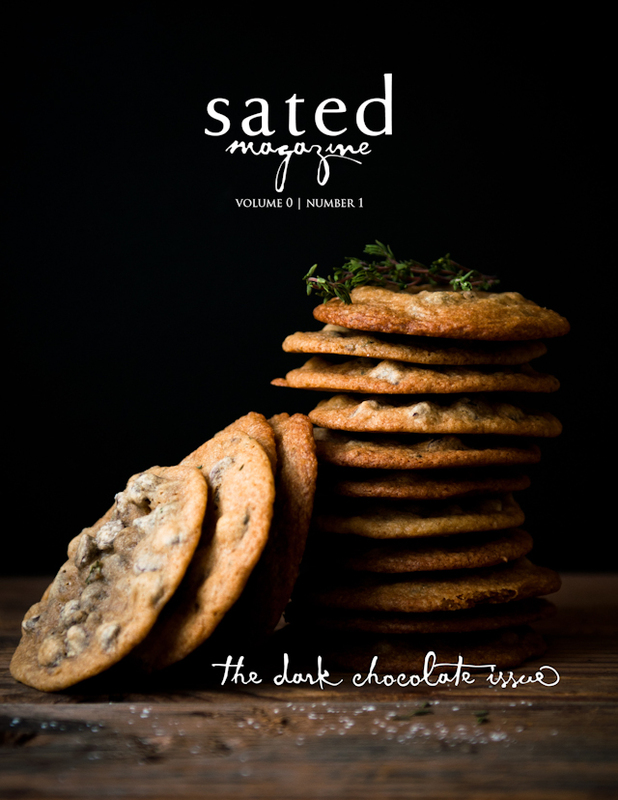 1. for oatmeal praline. 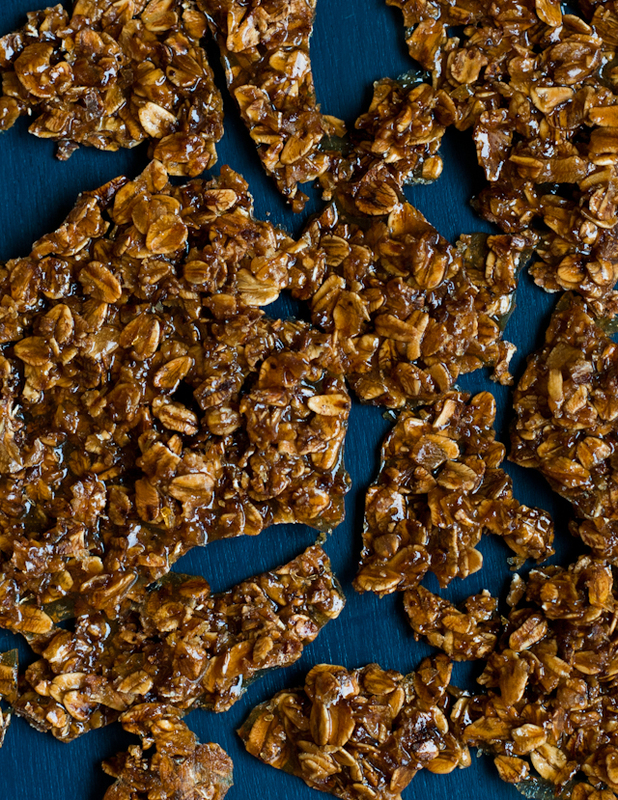 Preheat oven to 350° F. Spread the oats on a baking sheet. Bake for about 7 to 10 minutes, stirring once or twice, until golden brown. Remove from oven and let cool. Line a baking sheet with a silpat or parchment paper. In a light-colored bottom saucepan, combine the sugar and honey over medium high heat. Do not stir—if necessary, swirl the pan to cook the sugar evenly. Cook until the sugar has turned a deep caramel color. Remove from heat and immediately stir in the toasted oats. Working quickly, spread the oats in a thin layer on the prepared baking sheet and let cool completely. Once cool, break into very small pieces. 2. for oat crust. Using a food processor or pastry cutter, mix the flours and sugar together. Cut the cold butter into the flour mixture until the size of small peas. Add the egg yolk and mix to combnie. Gradually add the vanilla extract and cold water while mixing just until a dough begins to form when pressed between two fingers. Do not overmix. Form the pastry into a disc, wrap with parchment paper or plastic wrap, and chill for at least one hour. Preheat oven to 425° F. Roll or press the cold dough into the tart pan to for a ¼-inch-thick crust. Trim off and discard the excess dough. Prick the bottom of the dough all over with a fork, cover with parchment, and weigh down with pie weights. Chill again if the dough has softened. Bake for 13 to 15 minutes until the edges have turned golden. Remove the weights and the parchment paper, and continue to bake for 5 to 7 minutes more until golden brown. Remove from the oven and let cool. 3. for milk jam. Combine the milk, sugar, and baking soda in a large, heavy-bottomed pot or dutch oven and bring to a boil over medium high heat, stirring occasionally. Once at a boil, reduce the heat to medium low and let simmer, stirring frequently and scraping the bottom with a spatula, for about 45 minutes to 1 hour, until the milk has turned a medium light caramel and is the consistency of jam. Stir in the salt, remove from heat, and let cool. Spread the milk jam onto the bottom of the cooled crust, smoothing with the back of a spoon or spatula. Top with a very thin layer of wild blueberry jam. 4. for dark chocolate espresso ganache. Chop the chocolate and melt in a double boiler. Keep warm. In a saucepan, combine the heavy cream and butter. Bring just to a simmer, remove from heat, and stir in the espresso powder. Gradually pour the hot cream over the melted chocolate, stirring constantly with a spatula. Add the honey and stir until smooth. Immediately pour the warm ganache on top of the jam layer, being careful not to disturb the jam. 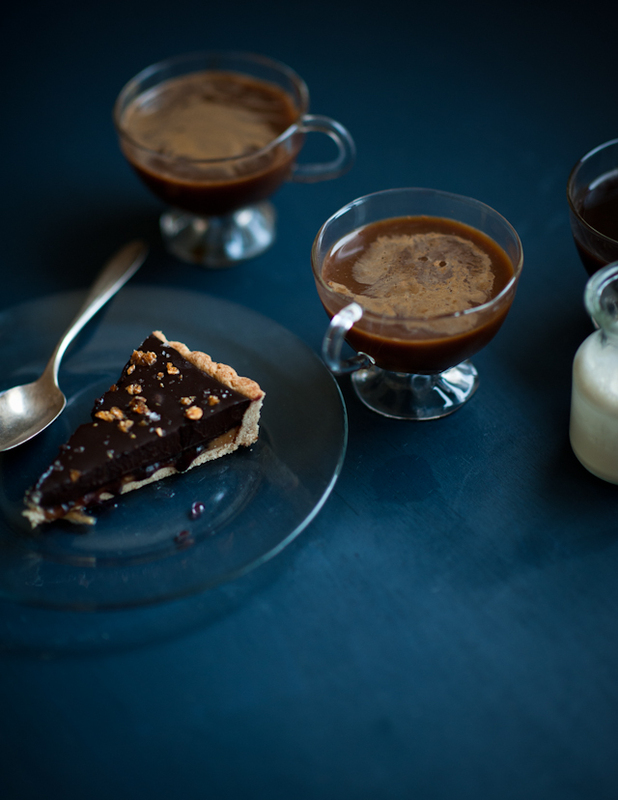 Do not overfill the tart; there may yet be a few teaspoons of leftover ganache. 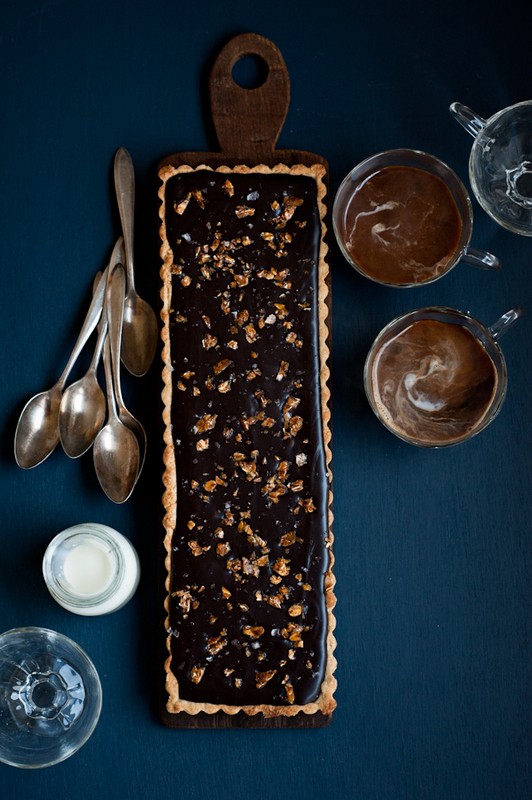 Just when the ganache starts to set, sprinkle the top of the tart with flaked seasalt and pieces of praline. Save any leftover praline for later use. 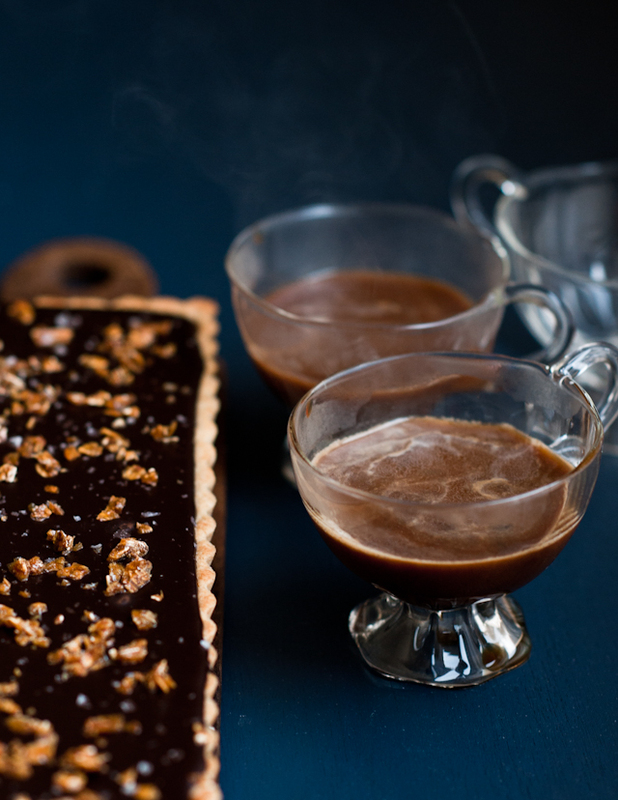 Let the tart set at room temperature completely before serving, about 1 to 2 hours. Milk jam recipe from Tartelette. The wild blueberry jam used here was provided to me by Bonne Maman. I've been a fan of their jams ever since college, and, per desserts for breakfast policy, I don't plug products on the blog unless I love and use them myself. Bonne Maman is great for simple, solid jams for dessert purposes, and the wild blueberry flavor here--with whole wild blueberries inside!--is really perfect for this tart. Wow this looks brilliant! Wouldn't mind this for breakfast! Perfect breakfast for chocolate lovers! Love all the photos and I should definitely try it one day! Ah, there's the beauty I saw on Instagram! Absolutely beautiful and delicious! oh my gosh.. will you look at that!! did you seriously make that... jeez.. what a start to day!! U'll be on a chocolate high all day!! This is absolutely beautiful! And I love how elegant a dessert it is, despite being inspired by breakfast! This is one stunning tart! I seriously envy you for the concept and seeing this through to the end with the various different components. I often dream of putting together more elaborate tarts but then shelf such ideas away in favour of something simpler - your post is motivation enough to get back into the kitchen and start making some praline while watching over the milk jam on the stove and resting some oat flour crust in the fridge (oat flour is my new thing by the way, so happy to see an oat flour crust recipe here!). To cut a long story short, this post put a smile on my face! So beautiful. The oat praline is brilliant! Love the photos and dark blue background. Yum. Gorgeous. Love how dark and silky this looks. I cannot wait to try this!! 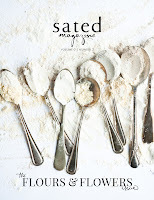 I am in love with your blog...found it through Tami's "Running with Tweezers." Stunning photos as well! stephanie, you are brilliant. i've got to try this. This looks and sounds absolutely spectacular. I'd like some now!